Ravissant, The world’s finest silverware presents ' Silver Splendor ' Exhibition which is taking place at Ravissant stores in New Friends colony and DLF Emporio, Vasant Kunj from 25th September to 27th September, 2014. Ravissant will be showcasing the most luxurious products in silverware which are designed by international designers and master silversmiths from Europe. Ravissant has looked to different cultures and natures itself. This collection is inspired from the wilds of flora and fauna to majestic civilization. 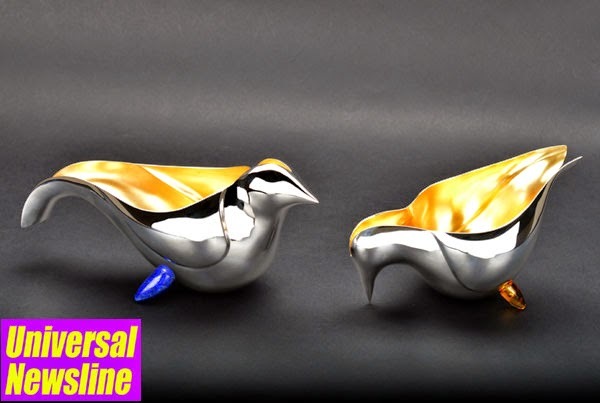 Ravissant has interpreted these inspirations through the prism of their own imagination to create a succession of prestigious silver creations which includes Humming birds in sparkling silver as candelabrum, sitting and picking birds as nut bowl and splashing birds at a table fountain. The collection of products includes center pieces, candle stands, dinner sets, platters, Tea sets, coffee sets, Nut bowls, Table fountains, Cutlery, Water jug sets, Soup tureen, Champagne buckets, wine & champagne glasses, Ice tongs and other bar accessories. These rare and unique products are hand crafted in sterling silver with different stones like rose quartz, jasper, lapis, jade, rock crystal and Murano glass which makes them inimitable. Different techniques have been used in these products i.e. hammering, chasing, enamelling and wire mess technique which gives it a very unique touch. So bring your friends and family to indulge in shopping galore at Ravissant stores. Inspired by the vision of an innovative silversmith, rich in tradition, Ravissant silver was launched in 1991. Ravissant has in the past 20years designed and manufactured over 5000 original designs including works of master designers in silver smithing, such as Yann Van Nouhuys, Arjen Lucus, Paul de Varies from Holland, Michael Boy, Petra Borgann, Michael Durrie & Ralf Auerbach from Germany, Alistair McCallum & Phil Barnes, Simone Ten Hompel from UK, Paul Binder from Switzerland, Ned Vernon, Karl Millard from Australia and Patrizia from Italy. It was the creative, dedicated and innovative designs which have made Ravissant the artistic and intellectual center of silver smithing. Ravissant uses the finest quality of alloy that contains 92.5% of silver. The high value of the raw material ensures that the product value increases over the years. In addition, Ravissant silverware is exceptionally easy to clean; it is dish washer safe and extremely resistant to tarnish. Every piece of Ravissant be it cutlery, tea sets, candle stands, bowls, dinner service, is hand produced by Ravissant’s master silversmiths in our workshops. The crafting of relief surfacing to hollowware has always required the most difficult of techniques in the art of silver smithing. The smooth protruding elements which capture light and reflect its setting are hand worked with a technique that require complete mastery of the material. The vivacious elegance of the Ravissant’s products shows nothing of the difficulty involved in the production. Ravissant’s specialty is in qualifying the present moment in design rather than restyling the past, by employing new technology with new material to define new shapes. The quest is to create a form which touches the soul. Every product that leaves our house is adorned with a stamp of Ravissant, 92.5% purity, year of making, the craftsman and the designer’s hallmark. The articles shown in our website and catalogues represent only a small range of the collection. A large range of designs, not shown in the catalogues, are available in our boutiques and many more can be designed on request. Ravissant also offers repair and cleaning services of its own products. Ravissant is a family owned company with a staff of over 500 qualified members who are deeply committed to producing and selling the finest product lines. The company is owned and managed by Ravi & Mina Chawla and their children Vishal, Charoo & Malini. Everyone is warmly welcome to visit our exquisite stores in Delhi & Mumbai at the following address.